Since MTV only aired 5 songs, Fade, Outside, It's Been Awhile, Epiphany, and Can't Believe are now available in new mp3 files. The quality is better - it's less scratchy, but it's also a bit echoic. And they're really in stereo now. On the downloads list, the file names have "new" in them since the old mp3 files which sound a bit different will still be available. I have digitally enhanced both these mp3's. There's a huge difference in the sound, much better than what you get off mtv2.com! Download them now! I've have enhanced the mp3's from Hampton Beach and Ypsilanti. The Hampton Beach songs sound much better now - less flat and more definition. 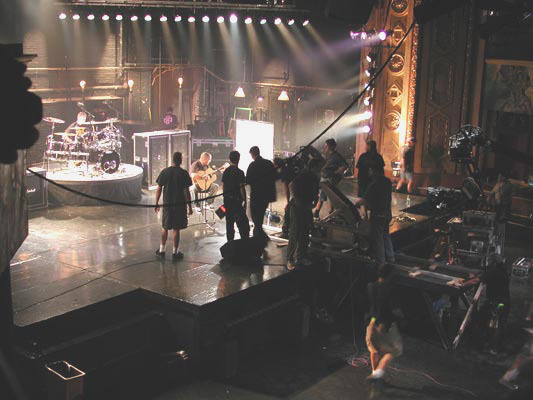 Staind recently worked on filming "Outside," for a new European music video, at The Paramount Theater in their hometown, Springfield, Massachusetts. When the video airs in Europe, look for it on the downloads page.